Shopping in Sydney, particularly for first-time visitors to the city, can be pretty much a hit-or-miss affair in matters of quality and price. It's important to know what you're looking for, in a general or specific way, and where you're likely to find things. There are concentrations of shops in particular Sydney areas that should be of help in your search for items you'd like to buy. Or you may just be interested in window shopping to see what different things are available. Large numbers of Sydney visitors look for mementos of their travel to bring home. These could be low-cost items such as fridge magnets, tiny koalas or keyrings, or more expensive items such as chokers fashioned out of Australian pearls from the Western Australia town of Broome, unique Australian gemstones, or original Aboriginal paintings. 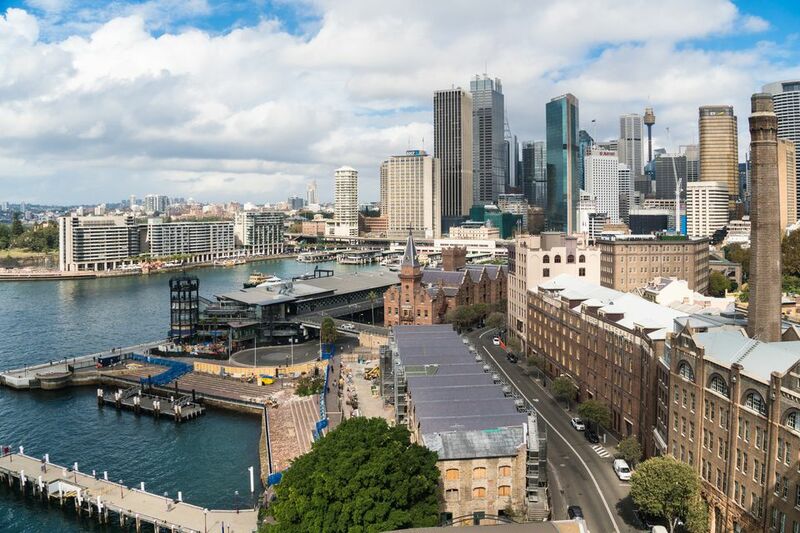 For relatively low-cost souvenir items, a starting point could be Circular Quay with its small shops in the train terminal itself, or along Alfred St in front of the terminal, and then along George St north to The Rocks. In the Rocks area, you may want to explore the side streets and alleyways off George St and Argyle St. Note that there is a visitor center on Level 1 at the corner of Argyle and Playfair streets where you may wish to request more detailed information about places to visit in Sydney and elsewhere in Australia. Find out when The Rocks Market on George St takes place — weekends, nights, or special days — as you may find craft and art objects, as well as out-of-the-ordinary items, here. Away from the relatively touristy areas of the Circular Quay-Rocks district, head south on George St — you may want to catch a bus — to the Sydney markets on Hay St in Chinatown. There are various types of opal products ranging in price from cheap to absolutely expensive depending on the composition and rarity of the product. You will find low-cost opal products — pendants, earrings, brooches, keyrings, and similar items, with doublet or triplet opals — in the souvenir shops. For truly good quality opal you'd need to visit a jewelry store, preferably one specializing in opals. For Australian pearls, again it's best to visit a jewelry store, preferably one specializing in them. Duty-free opals and pearls are available from duly designated shops on presentation of relevant travel documents. Authentic Aboriginal paintings are to be found in various Aboriginal art shops in Sydney. For the Sydney visitor still trying to grasp the Sydney geography, among the more accessible ones, are probably the Aboriginal Art Shop at Sydney Opera House and the Spirit Gallery in the Rocks Centre on Argyle St (the same building that houses the Sydney visitor center) in The Rocks. Other types of Aboriginal art, including mass-produced reproductions, as well as Aboriginal items like boomerangs and didgeridoos, are to be found in souvenir shops. Queen Victoria Building: There is a variety of boutique shops in the Romanesque-style Victoria Building on George St adjacent to Sydney Town Hall. There are shops on the ground and upper levels and don't forget the lower level starting from Town Hall train station. Pitt St Mall: This is arguably Sydney's main shopping district starting from Market St in the south to King St in the north. At the southwestern side bounded by Pitt St Mall and Market and George Sts is the Myer department store which began as Grace Brothers in 1885 on George St, then Bay St on Broadway and in its present location in the city. The Grace Brothers chain was sold to, and became part of the Myer chain, in 1983 and later adopted the Myer name itself. On the other side of Pitt St Mall is Centrepoint, now Westfield Sydney, another shopping complex, distinguished as the location of the landmark Sydney Tower Eye. To the east of Westfield Sydney is the upmarket David Jones, founded in 1838 and reputedly the oldest continuously operating department store in the world still trading under its original name. At the northern King St end of Pitt St Mall is the MLC Centre which houses the Theatre Royal and a number of distinctive fashion and jewelry shops. The various shopping arcades in Pitt St Mall are worth a visit for sometimes unique but less known items. Darling Harbour: At the western side of Cockle Bay in Darling Harbour, the twin buildings, known as Harbourside, house various types of shops as well as waterside restaurants and indoors some fast-food shops and bars. These are by no means the only places to go for shopping but are the most accessible for visitors to Sydney, being in the heart of the city and reached by foot, City Circle train, tram, monorail, or bus.